The meta title of your page has a length of 112 characters. Most search engines will truncate meta titles to 70 characters. The meta description of your page has a length of 187 characters. Most search engines will truncate meta descriptions to 160 characters. Congratulations! Your webpage is successfully compressed using gzip compression on your code. Your HTML is compressed from 299.37 Kb to 50.25 Kb (83% size savings). This helps ensure a faster loading webpage and improved user experience. Your website loading time is around 5.12 seconds and is over the average loading speed which is 5 seconds. Your site is not using cache headers for all of your images. The cache headers can help speed up the serving of your webpages for users that regularly visit your site and see the same images. Learn more about how to add expires headers to your images. 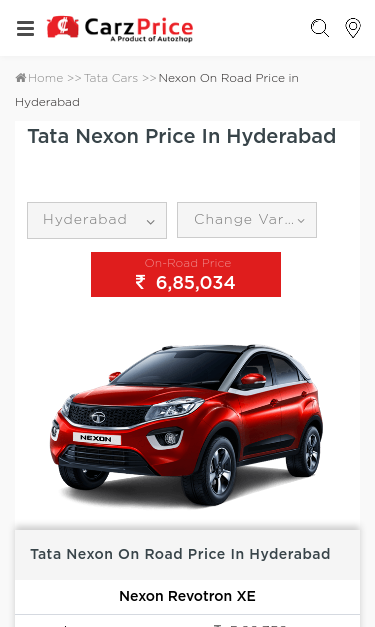 https://carzprice.com/tata/tata-nexon-price-in-hyderabad/nexon and https://www.carzprice.com/tata/tata-nexon-price-in-hyderabad/nexon resolve to the same URL.